Monday – Took the day off to rest my achilles. Tuesday – Three easy miles to get back into it. Wednesday – Yoga over lunch. Hurt so good! Thursday – Two mile warm up, six miles at 8:55 (actual splits: 8:50/8:54/8:50/8:58/8:51/8:52) then one mile cool down. Friday – Easy six miles – I broke this up into four miles in the morning and two after work. 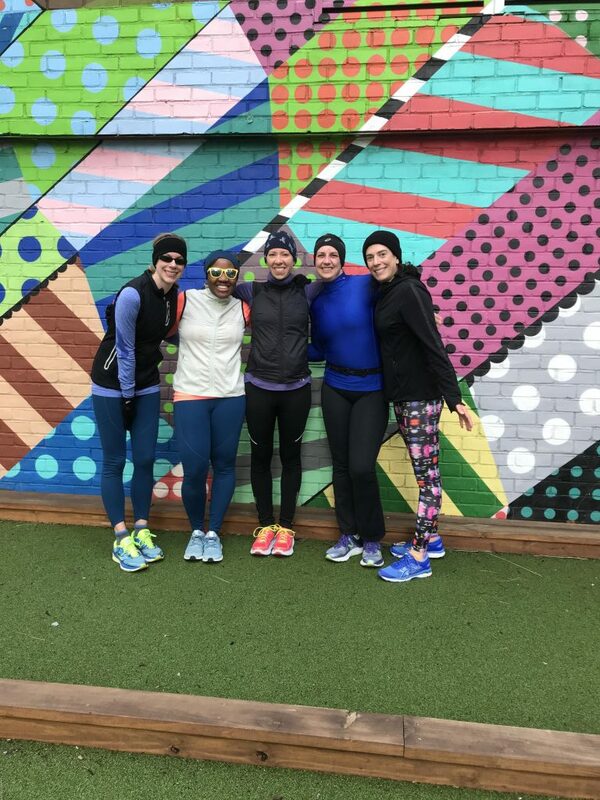 Saturday – Fourteen miles! The longest I have run since my last marathon in November. I then got a massage afterwards and HOLY HECK. It was my first experience with the Graston technique and it was incredibly painful as the therapist worked to break up the adhesions in my calves. The massage was helpful however, and I’m going to go every couple of weeks leading up to the marathon. Sunday – Three easy miles + core work. Tuesday – This was a hard one. It was cold, rainy and windy and I had a workout on tap. Here was the workout: two miles warm up, two miles@ 8:40, 4 mins rest, 8×400@2:00 with 90 seconds rest between, 4 mins jog, 2 miles@8:55, one mile cool down. This was super super hard. I was a bit slow on the first two miles and for the last few 400s but pulled it together for the 8:55 miles. I was wiped (and frozen) after this one! Wednesday – Rest day is the BEST day! Thursday – Seven easy miles plus core work. Friday – Two miles warm up, four miles at 8:45 pace, one easy mile, then one mile at 8:20-8:30 pace and then a cool down. This felt like work but I felt strong. Saturday – 15 miles on a hilly route around DC. I ran from my house to the steps of the Lincoln Memorial to watch the sunrise. Then ran into VA to meet my Saturday group for the rest of the miles. It was a challenging run with some climbing but I was happy to get this done with my girls! Sunday – Three easy + core work. What’s the weather in your neck of the woods? We had a snow day on Wednesday and it’s still cold. Sigh. Wow, you’re doing great so it sounds like the ankle pain is behind you. That’s awesome! We ended up with about six inches of snow out here. How much did you get in DC? Thanks – it is lingering but I’m continuing to work on it! We had 4-5 I think – I didn’t measure but it was definitely the most we’ve had since 2016! We were in D.C. for the march over the weekend and I checked out every runner to see if it was you! I’m looking forward to some D.C. running in two weeks at Cherry Blossom. Hopefully see you then. Happy running!!! Fun! Yes – there will be brunch the day before the race and a picture at the start. See you then! Awesome job Courtney! I know that Graston is painful but it will really help! Oh yeah that mess HURT! LOL – but it means that my muscles were crazy tight so I know I need it. There is nothing better than getting a long run done with your girls!! Glad they could join you, it really makes such a difference. I love your comment that the yoga “hurt so good”. When we are in pain in pilates class, my instructor loves saying “Feel that!! Isn’t it just beautiful!?! What a beautiful feeling”. Haha. I’m kinda jealous of your Graston. I haven’t found anyone here who does that and wish I could! I’ve heard it hurts like hell but I’d deal with it to feel better. Looks like you had two great weeks of training- doesn’t it feel awesome to reach your “longest run since…” type milestones? Love it. I am beyond over this winter weather. Not only did I get to “enjoy” the 5 inches that we got on Wednesday, but now I’m at my parents’ house in Illinois and its a winter wonderland here. Where is Spring?!?!? It’s still cold here, FYI. Sigh! Great couple of weeks of training! I had that Graston technique done on my knees years ago – hurt so good! Looks like it’s working well for you and you’re hitting all those hard paces! I’ve just discovered your blog. I love it. I feel like I know you already haha. I live around Rochester, MN so around 3-4 hours from Duluth! 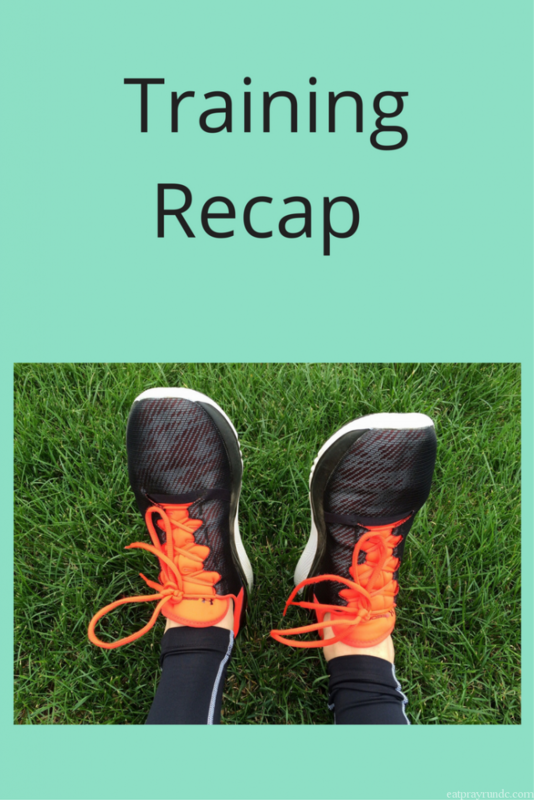 I’m also training for a race (half marathon – my first one)! Well, welcome! And good luck to you – what race is it? I am running the Scheels Med City Half Marathon. It’s 8 weeks away! Ah so nervous. I’m finding myself bored with training at this point. Suggestions for pushing past that? I started jump roping the past two days and that is a nice break. Good luck! I would say revisit your why – your training has a purpose and at this point it’s good to remind yourself of that. Also – can you do some runs with a buddy? That always makes it more fun! !